Machining plastic is an art. Product designers are looking for ways to replace machined metal parts with plastic parts. Our fully equipped temperature controlled technology centre produces MACHINED PLASTIC PARTS and custom plastic parts across a wide range of applications. Our trained staff is qualified to work across the whole spectrum of engineering thermoplastics. Plastic machining offers an alternative to traditional steel, phosphor bronze, aluminium and stainless steel parts to improve machine and production performance. Plastic machined parts are light-weight and used where chemical resistance, electrical resistance, quietness or extreme wear resistance is required. WE MACHINE ALL ENGINEERING PLASTICS. We specialise in machining plastics into products with complex geometries and tight tolerances. Chemical and corrosion resistance and inertness. 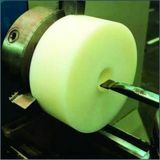 Typical applications for engineering plastics, range from electrical insulation components to heavy duty wear parts, food processing and packaging industry components. More than 50 machinable plastics are available for the manufacture of these components, replacing traditional materials such as bronze, stainless steel and aluminium. The advantages are superior wear life, saving in weight and reduced noise. Mitsubishi Chemical Advanced Materials Chemplast (Pty) Ltd offers the full range of high performance engineering plastic products. We have branches in all the major industrial centres throughout the country for your convenience.